Following her lifelong dream, Hope Jones finally opens the charming Brontë Bookshop in the rural hamlet of Sweet Springs tucked away in the rolling, green hills of the Virginia piedmont. Her best friend and business partner Peggy Sue Roswell assists Hope along with her spirited fifteen-year-old daughter Stacey. Their tuxedo cat Nozy Cat, the bookshop mascot, likes to sleep by the cash register while he guards it. One summer morning, Hope opens up the bookshop and finds the town’s handyman Hugo Spangler lying dead in the poetry section. Sergeant Trogg rules it a homicide and casts a hard eye on Hope and Peggy Sue as his prime suspects. 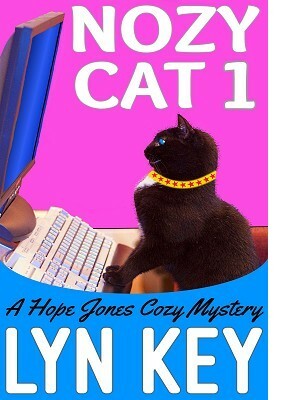 Fortunately, Hope can rely on her incredibly clever, resourceful pet Nozy Cat when she gets busy applying her sleuthing skills to track down and identify the real murderer among the three suspects. The Hope Jones Cozy Mystery Series offers mystery fans a clean read and traditional whodunit with loads of good-natured humor and a perfect dose of the paranormal.